The Verity V91 Max (formely known as the SV91M and SV91HD/DLT) is a special unit for erasing hard disk drives & DLT tapes but also suitable for Audio, DAT, VHS and S-VHS, VHS Digital, 4&8mm, Beta SP/digital, video cassettes, floppy disks. Computer cartridges: DC, TK 50/70/85, DLT 3489/3490/3590, 4 & 8mm.If you require erasure of a full array of magnetic media including high density metal drives, tapes and cassettes, then the Verity SV91M is the degausser for you. The SV91M is CESG and NATO approved, taking as little as ten seconds to completely erase a cassette and 3 minutes to erase a Hard Drive. Please note that this model is also sold as the SV91 DLT/LTO and V91 HD/DLT. They are the same machines with different coloured exterior. 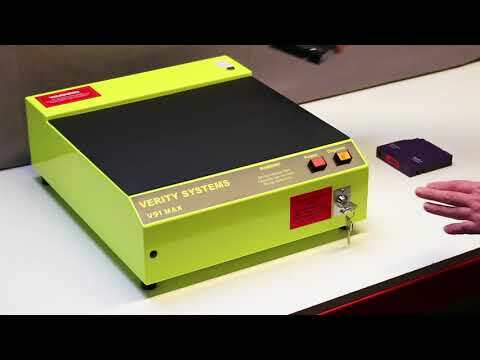 The Verity SV91M is simple to use and provides a thoroughly effective and low cost means of degaussing DLT, DAT and other high coercivity tape. It is also suitable for erasing PC hard drives for security purposes and the V91 Max is particularly recommended for erasing defective or damaged drives where other types of erasing may not be effective. The V91 Max is a low noise, manually operated unit that sets neatly on a table top and has been designed with security operations in mind, as its powerful degaussing fields can erase even metal particle tape. The V91 Max is ideal for the security conscious, low volume operator who wants to have a professional, low budget solution to eliminate magnetic media security risks.